To cancer research stakeholders, Friends of Cancer Research (Friends) is known for substantive dialogue and strategic policy. Their largest accomplishment is passing breakthrough therapy legislation in collaboration with the Food and Drug administration (FDA) to expedite the development and review of drugs that have the potential to save lives. Outside a core group of cancer researchers, Friends is virtually unknown. As a result, growth was limited because key stakeholders were unaware of their potential to influence change. I interviewed experts from organizations including the Food and Drug Administration, American Society of Clinical Oncology and the American Association for Cancer Research. An onsite ideation session, SWOT analysis (strengths, weaknesses, opportunities and threats), and other analyses activities yielded the following insights to guide the website redesign. Speak to all of the stakeholders with language they can understand. This includes media, Capitol Hill staffers, legislators, scientists, doctors, other advocacy organizations, etc. Demonstrate that Friends lives in a middle ground between research organizations that can seem too analytical and advocacy organizations that can appear too emotional. Balance macro level successes like legislation with all of the small steps it takes to achieve them. Keep it personal because cancer means something to everyone. 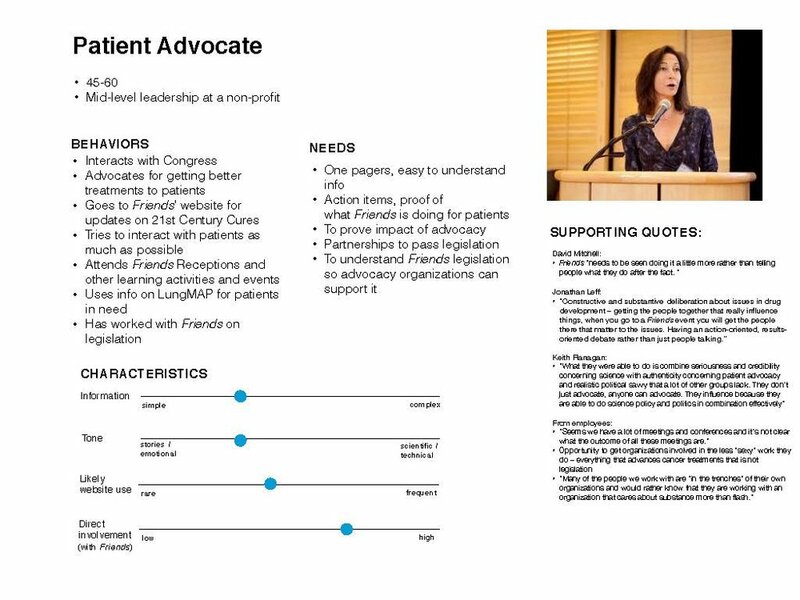 The new navigation helps partners, patients and policy makers quickly find the content they are looking for. 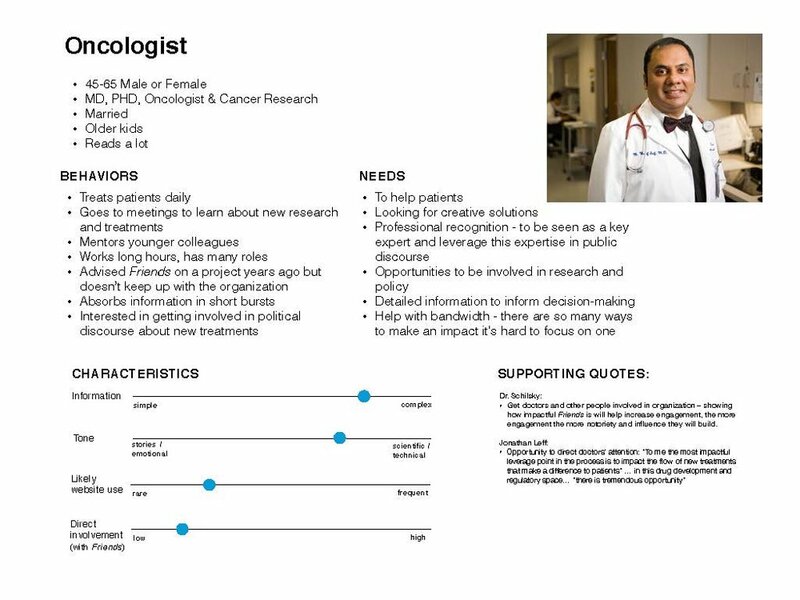 Simplifying resources (fact sheets and a glossary of cancer terms) makes it easy for the public to understand the science behind their work. Clear language describing Friends’ mission makes it easy for all stakeholders to understand and remember the organization. I proposed a homepage design that demonstrates Friends’ value to their stakeholders and makes it easy for users to connect with the organization.